Hi readers! 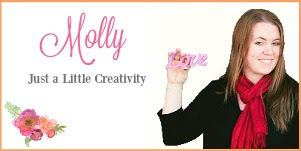 It's Molly from Just a Little Creativity, and I'm so excited to share this cute Christmas project with you. As we all know, farmhouse style is all the rage. And if you've browsed Pinterest, you'll see that this decorating style looks fantastic in Christmas decor. These rustic snowmen are easy to make, and add the perfect touch of the distressed, vintage look to your farmhouse mantel this year. I actually picked up my set of snowmen last year at Target, on clearance after the holidays. But you can find unfinished wood snowmen like these at most craft stores during the holidays. To begin, I painted them white with chalk paint. I'm sure regular craft paint will work as well, you just may need to prime them first. Then using a sanding block, I distressed the snowmen in a few places by sanding the white paint back off. I do a lot of furniture makeovers, and I like to seal my pieces with wax. A brand that I discovered this year is called Daddy Van's, and it's wonderful. I highly recommend it for any projects that need wax. And for the rustic antique look, I used the antique brown wax. Now, there are many types of similar products on the market, so use what you have or what you can easily attain. And if you don't want to use wax at all, you can follow these instructions on distressing with paint, it's pretty easy. For the sake of this post though, I'm going to continue on with the wax tutorial. Using a brush, I covered the snowman in the antique brown wax. It looks crazy, I know. You can see the difference in the side by side. I didn't let the wax sit long, maybe a minute, and then using a rag, I rubbed it off again. What this brown wax does is knocks down the bright white look, gets into the cracks and crevices, and also enhances the areas that were distressed with the sandpaper. When it's rubbed back off, it leaves the snowman very rustic looking. I didn't wait before I sealed the snowmen with the clear wax. As soon as I wiped off the brown, I added the clear on top. This will seal the snowmen and also continue to take off any of the brown that stayed too thick. It acts as an eraser in a way. The last thing I did was used some of my favorite farmhouse styled Christmas fabric, and cut little strips from it to use as scarves. They would also be cute sewn or glued as little stocking caps (like these I made last year for Coke bottles). These would make great teacher or neighbor gifts, paired with some homemade cookies in a little basket. Have a happy holiday season, I'll see you next month!